Paige’s Music offers a variety of Hammond Design brass mouthpieces. Hammond Design mouthpieces are handmade by Karl Hammond near Chicago in Western Springs, IL. Hammond mouthpieces provide a fantastic combination of warmth and core while giving the player quick and dependable response. 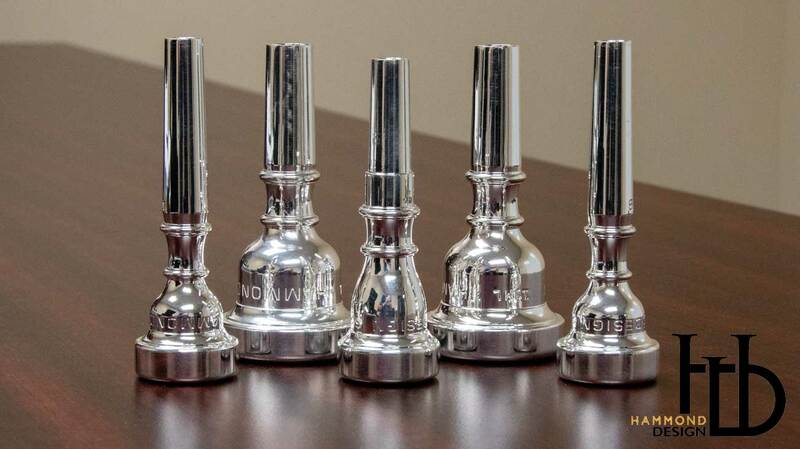 Mouthpieces for trumpet, mellophone, trombone, and tuba are all available through Hammond Design. Hammond’s numbering system is unique, and it is important to understand what the markings on a mouthpiece mean. These charts (trumpet and trombone) are helpful in understanding similarities between Hammond Design mouthpieces and other mouthpieces that may already be in your case. It is important to note that while the dimensions between a Hammond Design mouthpiece and a mouthpiece of another brand may be similar they may play differently. The following mouthpieces are available for testing in our store.